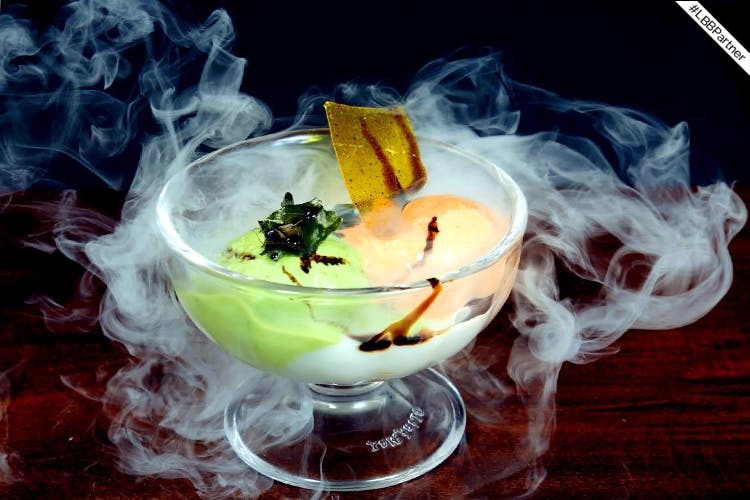 A Grill Company is a new restaurant in Noida, which is bringing us molecular art! Here’s why we think you should go here and try this. Instant crystallisation, smokey hues and lemon foam; A Grill Company doing molecular gastronomy right. Take your pick from a menu that includes Palak Papdi Chaat, Nacho Chaat, Dahi Bada, Dahi Papdi with yogurt spheres, Chai Samosa and Dragon Popcorn. They also offer a buffet meal, with dishes inspired from regions around the country, and a daily changing menu as well. Plus, there’s cocktails and desserts! We’re super excited about their grill kitchen, where they serve food—grilled right in front of you—followed by a buffet. Basically, this is where you come to eat, and then eat some more. The pretty interiors wins this restaurant extra brownie points, btw. Think a brightly lit space with wooden tables and lots of plants—you’re going to want to spend your evenings here, engrossed in conversation and of course, good food. Located in Logix City Centre Mall, A Grill Company is perfect for when you’re tired after a day of shopping, or just want to enjoy some quality time with your family and friends oohing and aahing over culinary science. Follow A Grill Company on Facebook here, Instagram here and Twitter here. This article is in partnership with A Grill Company.